Defiantly, Paula heads off to an artist colony to prove her father wrong. Once there, however, her leering male instructor criticizes her attempts to paint a picture of two apples, perched on a wooden table. She failed to successfully “portray nature exactly as it is, with precision and accuracy,” he tells her. But the whole idea of accurately painting a “still life” is a curious notion; since life, as with nature itself, isn’t “still” unless it’s dead. Instead, it’s all a matter of perception, which to the artist’s eye is subjective, as much as it is objective. And Paula – characteristic of the early expressionist movement – just sees things differently. So Paula grabs her canvas and easel, paints and brushes, and immerses herself in what were considered far less suitable subjects of life. And, in the midst of their gritty squalor she finds her own forms of what constitutes accuracy and reflected beauty for her. At one point, Paula tells her girlfriend and confidante her entire life’s ambition: Three good paintings and a child will suffice. After all, adding her own premonition, she does not anticipate living a long life. But meanwhile, the free-spirited Paula falls in love and marries Otto Mohdersohn, a widower with a young daughter. He is also a struggling painter, but follows the conventional artist’s path of what is considered acceptable -- and therefore marketable -- work. But after five years of waiting for her husband to consummate their marriage, a poet and kindred spirit’s simple invitation is sufficient for her to risk being committed to an asylum when she leaves her husband. Following Rainer Maria Rilke, she strikes out alone for Paris and another artist’s enclave. To the husband left behind, Rainer delivers the unwelcome news: “Your wife is on a journey into an unknown world.” The filmmaker vividly makes the point in an oft-repeated scene of Paula trudging across the screen with an easel over her shoulder representing the cross she must bear. 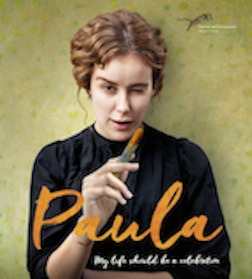 Like all bio-pics Paula combines historical fact with a filmmaker’s imagination that fills in those places of unknowing with universal themes found in what is most common and familiar to the human story. It is in this sense that PAULA is far more than an early women’s empowerment story, or pictorial lecture in art history. Below: Actor Carla Juri, posing beside the self-portrait of Paula Mohdersohn-Becker and the painting that depicted the artist’s creative genius, while reflecting her own life’s story.